Shaped like gold-dipped pyramids, each bar is made with pure ingredients to cleanse and moisturize. Should you be a guest in Cleopatra's modern day palace, you might find these elegant soaps in her guest quarters. 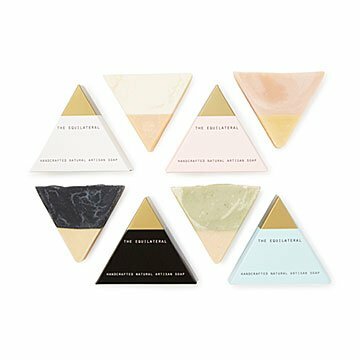 Shaped like miniature, gold-dipped pyramids, each ambrosial bar is made with pure ingredients and essential oils to cleanse and moisturize both face and body. The blissful scents include: Lemon and parsley, rose and blood orange, geranium and grapefruit, and lavender and palmarosa. Maker KaKyung Cho specially designs and handcrafts each bar with lavish ingredients like French pink clay and activated charcoal so you can treat your limbs to a royal lather, whether in a long bath or quick morning shower. Handmade in New York. Visit our blog for a tour of KaKyung's airy workspace in Newburgh, New York, a stone's throw from the Hudson. KaKyung Cho is an artist and crafter at heart. She fell in love with handmade soaps once she found the healing quality of it with right ingredients. She started as a fan but her curiosity brought in learning to make soaps; she enjoys the process of soap making and she hopes her love of handmade soaps spread in the world.